By George Crile. New York: Atlantic Monthly Press, 2003. 550 pages, photos, index. FOR most of his 24-year career in the House of Representatives, Charles Wilson was known for his abiding fondness for hot tubs, women and Scotch whiskey. His friends at the Central Intelligence Agency said, only partly in jest, that the Texas Democrat's reputation as a roué provided a perfect cover for his great passion, the mujahedeen rebellion against the Soviet Union's occupation of Afghanistan. During the 1980's, Wilson used his seat on a military appropriations subcommittee to steer billions of dollars in secret funding to the C.I.A. to funnel arms to the mujahedeen. So it was hardly a surprise after the Soviets' humiliating withdrawal in 1989 that the C.I.A. 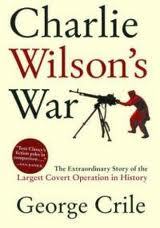 's spymasters invited Wilson out to celebrate at the agency's headquarters at Langley, Va. On a large movie screen in an auditorium at the George Bush Center for Intelligence flashed a huge quotation from Pakistan's president, Gen. Mohammad Zia ul-Haq, who had willingly allowed the C.I.A. 's arms pipeline to flow through his country. Zia credited Wilson..